As it prepares to celebrate its fifth anniversary, Asheville's Hi-Wire Brewing announced this week plans to open a new, satellite taproom about 225 miles east in Durham, North Carolina. The project will renovate a space in the city's historic "Golden Belt" building, which housed a textile factory starting in the early 1900s and is part of the National Register of Historic Places. The space will include a taproom of 8,844 square feet and an outdoor patio of almost 1,700 square feet. This is the third taproom for the company, which has its original location nestled among other Asheville breweries in the city's South Slope neighborhood, as well as their "Big Top" taproom and production brewery near Asheville’s Biltmore Village. It is, however, the first time an Asheville brewery has ventured outside city limits to build a standalone facility. Projected to be completed toward the end of this year, the Durham bar will feature 24 taps for Hi-Wire's full lineup, as well as other local options. Hi-Wire co-founder Chris Frosaker says he hopes the space eventually houses a 3.5-BBL pilot system for on-site production. Frosaker declined to provide Hi-Wire’s investment in the property. Before selling the space to New York-based investor LRC Properties in 2017, previous owner, Scientific Properties, listed rental rates for commercial space at $14 per square foot. The number of craft breweries in North Carolina has almost tripled in the past five years, the state boasting 257 at the end of 2017, according to the Brewers Association. Along with Virginia, the Tar Heel State has become a hot spot for beer in the Mid-Atlantic, and has seen some of the largest growth for craft beer sales in the country, along with Southeast states Alabama and Florida. Among a handful of U.S. municipalities referred to as "Beer City, USA," Asheville's city limits contain about 30 breweries, but Durham, with the fourth-largest population in the state, has only seven. That's now the same number of specialty-focused beer bottle shops in Durham, with breweries just pulling even in ratio in the past year. For a business trying to expand, Durham’s population of around 260,000 presents a unique opportunity as one of the fastest-growing cities in the state—one that's a short distance from the capital of Raleigh, which has about 460,000 residents of its own. The Triangle area of Durham-Raleigh-Chapel Hill is the brewery's second-largest market outside its home of Western NC, and has received distribution of Hi-Wire beers for about four years. A new physical space presents an ideal extension of that. The brewery is aiming for production of about 19,000 BBLs in 2018, essentially double what was made just two years ago. 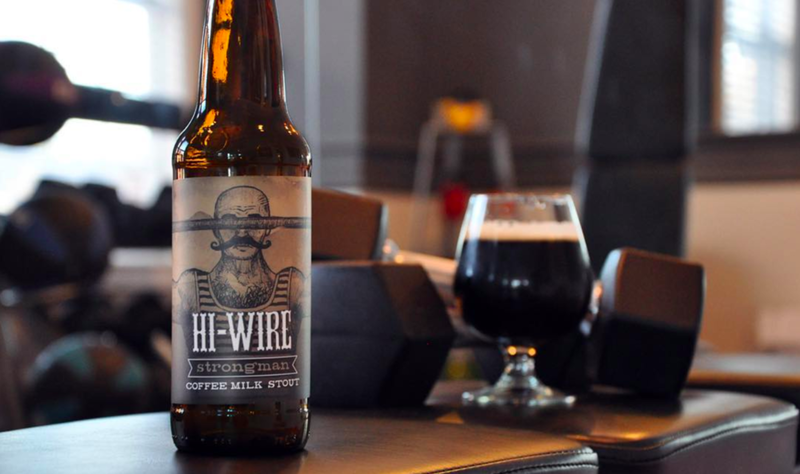 Hi-Wire's approach to stretch its reach across the state follows a popular pattern in beer, using multiple taproom locations to better connect with fans and benefit from better margins. Breweries as "small" as 2,500-BBL Biscayne Bay Brewing (Miami) to regionally-sized Odell (Denver) and nationally-distributed Ballast Point (Chicago) are some of the most recent examples of breweries focusing on new, physical locations outside their hometowns, which has quickly become a cornerstone in the own-premise space, along with creating destination breweries. "Putting the taproom first and building the rest of your business around an own-premise model gives a brewery unprecedented control, insight, and flexibility—all crucial tools when navigating this exciting and complicated time in the beer business," Bissell Brothers Brewing Co. co-founder Peter Bissell recently wrote for GBH. For Hi-Wire, this seems especially true. While Asheville's population is just below 90,000, Buncombe County, of which the city anchors, hosts almost 10.9 million tourists every year. (The local minor league baseball team is fittingly called the Asheville Tourists.) Branching out means harnessing potential Hi-Wire has only sought in Durham through distributed beer and a sales rep. When Hi-Wire does open the new location (Frosaker’s currently gives an optimistic timeline of October), the brewery plans to do so in proper fashion.